Question: How to make twitter bootstrap menu dropdown on hover rather than click? Question: How can I make Bootstrap columns all the same height?? Question: What is sr-only in Bootstrap 3?? It is class used to hide information intended only for screen readers from the layout of the rendered page. Question: How to disallow twitter bootstrap modal window from closing? 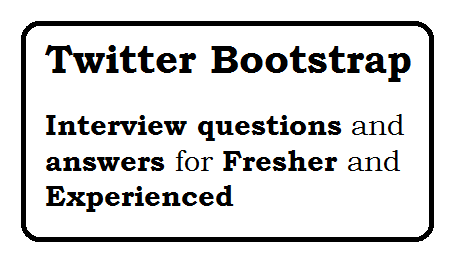 Question: What are different 4 tiers in twitter bootstrap? Question: How to use media queries in twitter bootstrap 3? Question: How to use media queries in twitter bootstrap 4? Question: What is an em? An em is a unit in the field of typography, One em is equal to the 16 point size. Question: How to open a Bootstrap modal? Question: How to make responsive image with align center? Question: How to create Confirm box before deleting modal/dialog? Question: How to disabled the button? How to detect and change Browser user agent?. Overriding The Default Text Selection Color With CSS. EmberJS Interview Questions and Answers.